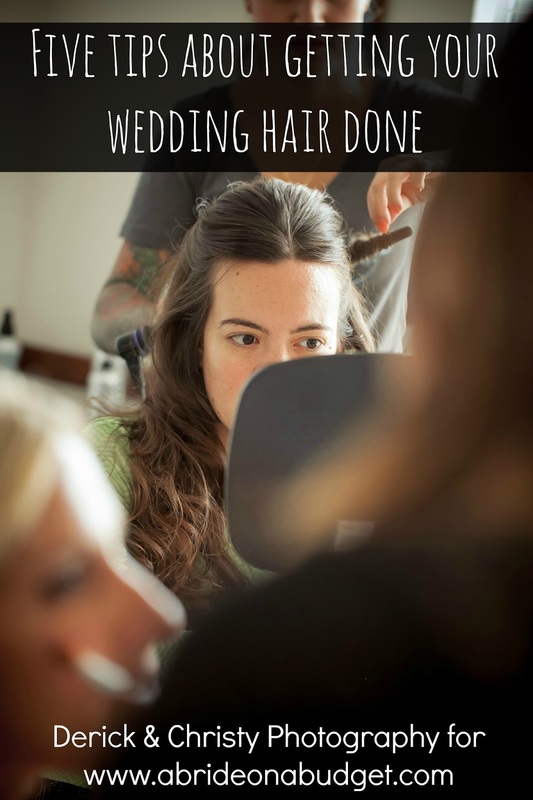 A Bride On A Budget received one of these items for review. All thoughts and opinions belong to ABOAB. 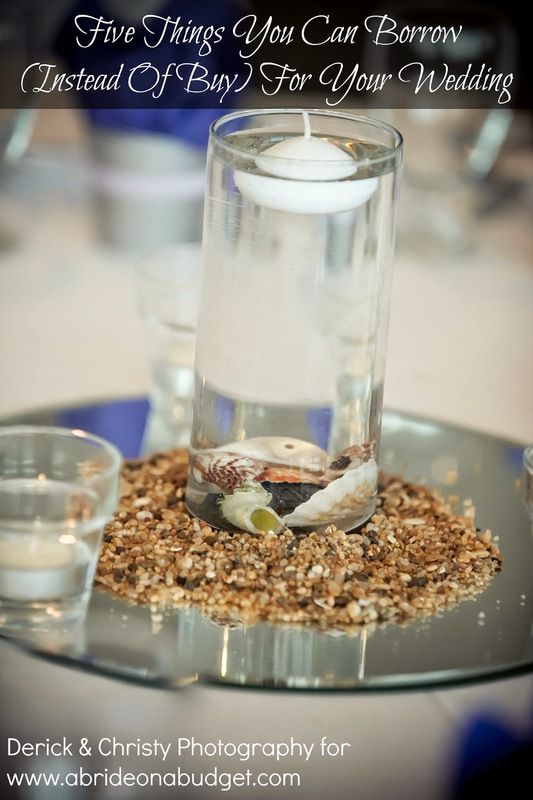 I've said it time and time again: Don't cut wedding favors. I have such a spot in my heart for favors and I really think they are such a wedding necessity. There's the argument that you are already paying for guests' meals, so you shouldn't have to get them a thank you for eating said free meal. And then there's the argument that many guests will pay for their plate, so you should give them a thank you for that. And then people say the thank you card is the thank you. 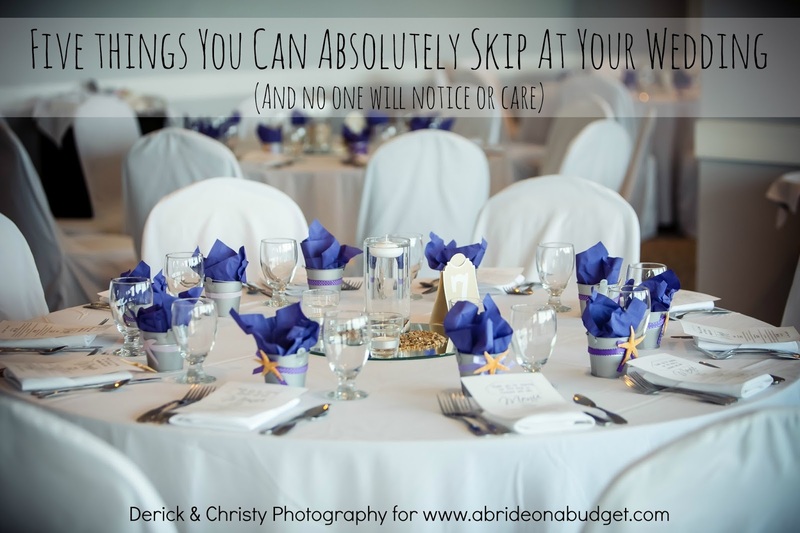 And you can argue back and forth and around and around, but the easy solution is just to take my advice and get favors and spend your time on other wedding tasks instead of wasting it trying to figure out if you should or shouldn't cut favors from your list of things to buy. The majority of people who I've spoken to have said edible favors are the way to go. They are likely to get eaten and enjoyed on the car ride home. And, if you're giving an edible favor, make it chocolate. Everyone loves chocolate. 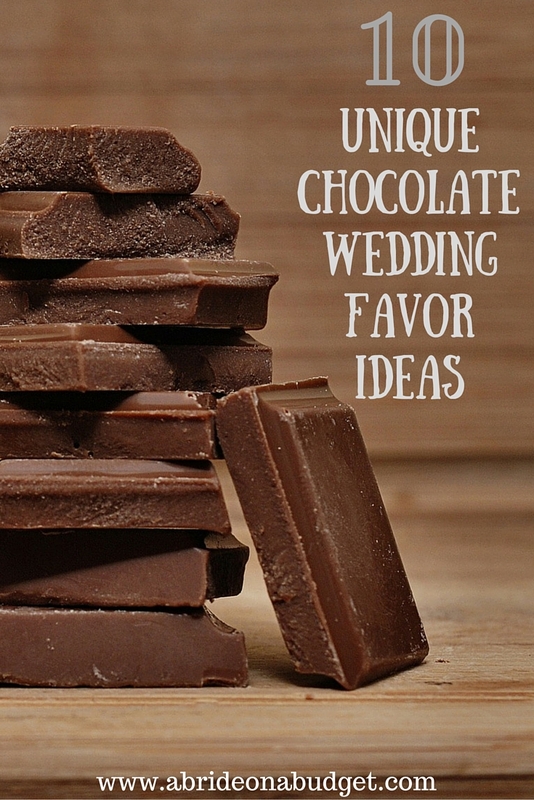 So I went ahead to help you and put together a list of ten unique chocolate wedding favor ideas. Hopefully you can get to the end of the list without drooling on your screen. I love anything decorated like a bride and groom. There are very few times in your life that you can purchase these, so you should do it while you can. That's why you'll see a bunch of those items in this list, starting with a bridal chocolate covered Oreo pop. You can purchase them as a bride and groom pair, just brides, or just grooms, depending on your needs. That's always nice. 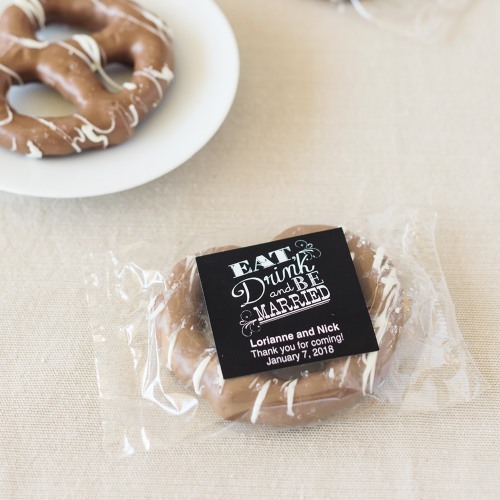 These bride and groom fortune cookies are actually the inspiration behind this post. I saw them and just instantly knew they'd be a great wedding favor. What's fun about them is you can choose the message that goes inside them. There are a few stock messages to choose from or you can craft your own. Any time you can sneak a little personalization into your wedding, you definitely should. And if you want to on your favors, go with the chocolate bell favor. You can pick from three different types of chocolate and then have your wedding date written on the bottom -- in chocolate. Yum! There's a shop by my New York house that sells incredible chocolate covered pretzels. Seriously, they're the best. You can't get them unless you live around there and, really, I don't live around there any more either so I can't get them. So we have to settle for this chocolate covered pretzel that we can order online. You can personalize it with a sticker, though, so that's a bonus. 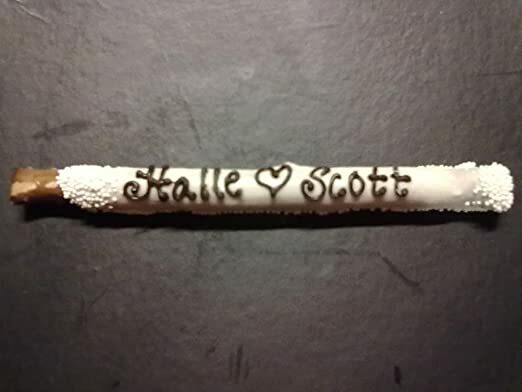 If you like pretzels, but you're more of a rod person, pick up these personalized chocolate pretzel rods. They're dipped in chocolate and have your names written on them in chocolate. I hope you have long names because that means more chocolate to enjoy. What's better than chocolate? Chocolate covered chocolate. 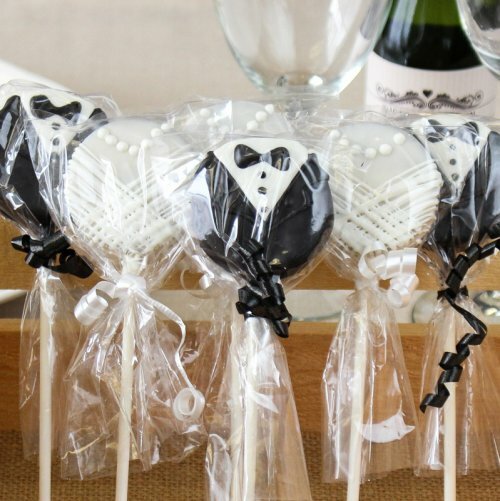 Like these mini wedding brownie pop favors. They're brownies dipped in chocolate and then adorned to look like a bride and groom. Yes, just yes. Pete loves biscotti. It's his favorite. I have a great biscotti recipe, so I'll probably post it and make biscotti favors in the future. But, for now, you can order these chocolate-dipped biscotti favors. You can have your names and wedding date added to them, making them special. 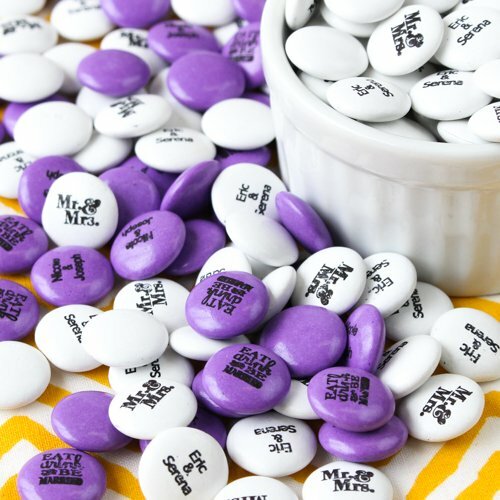 How super cute are these personalized wedding mint chocolate candies? You can add a graphic on one side (and choose from a variety of them too) and add your names on the other. You can choose your wedding colors for them too, so your wedding favors match the rest of your decor. You'll want to pick up some sort of small bags to put these in since you can't really leave loose candies all over your table. Personally, I would go with a clear treat bag because the whole point of them (with your names and colors) is lost if you stuff them in a non-see through bag or box. I had an idea recently about making these, but now, I don't have to. And you don't either. Just pick up these chocolate-dipped krispy treats. What's fun about them is they're hand-decorated with non-pariel sprinkles and royal icing wedding designs. So cute. The photo above is the sweetheart favor from L.A. Burdick. The mice, if you can't tell, sit on a base that's about the size of a dime. Their tails are colored ribbons can be customized to match your wedding colors and that cost is included in your favors. They're pricey, but they're amazing -- and I'm a chocolate snob, so that's high praise. The outside is hard chocolate and inside is a soft and creamy ganache. Each favor has a different filling, so you might want to choose your favors carefully if there's a flavor you don't enjoy. 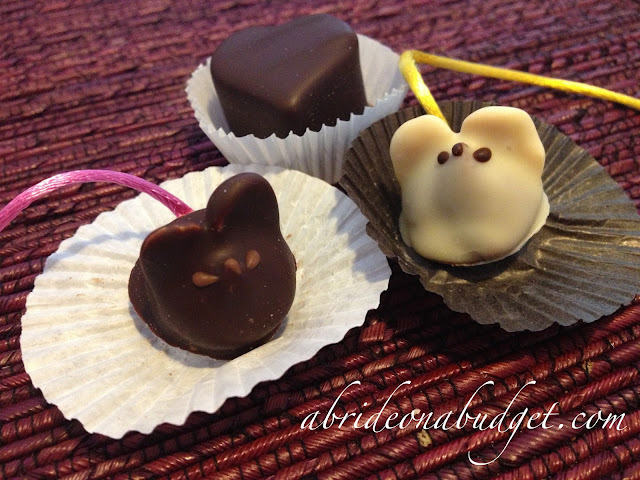 BRIDAL BABBLE: Which of the chocolate wedding favors do you like best? 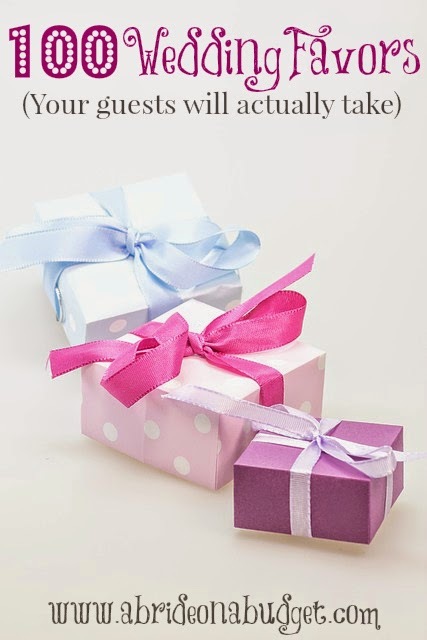 100 Wedding Favors (Your guests will actually take). I like the little mice the best! They are so cute!